How to Reach : St. Anne church can be easily reached by hiring local transport like buses, taxi and autos in Goa. 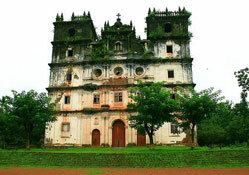 The church of St. Anne of Goa is noted for its remarkable architecture in India. The present day church was reconstructed by Mons Francisco do Rego with his own money. Due to some unforeseen circumstances, he could not complete the construction and Father Antonio Francisco da Cunha was bestowed with the responsibility of completing the construction of the church. The church was finally completed in 1965. The story as to how the church got the name of Saint Anne is very interesting. The villagers who were living in Talaulim in Goa in the year 1577 purchased a plot of land on which a small monastery was to be built to ease the process of conversion. Though the monastery was constructed, it was not dedicated to any saint. One day a man reported an incident in which he had a vision of a woman walking down the hill with a cane and a hat and claimed that the monastery was her abode. At the same time, a Brahmin woman claimed that a similar woman had held her hand in her dream when she was very sick thus miraculously curing her. The woman had told her that her name was Anna and she wanted to reside in the monastery. The Brahmin lady graciously converted to Christianity following the miraculous cure. The whole village was stunned and the priest decided to sanctify the church in the name of St. Anne. This is how the church came to be known as the Saint Anne church. Every year, the feast of St. Anne is celebrated throughout Goa on July 26th. In Talaulim it is celebrated with much more fun and enthusiasm and is known as Cucumber Feast. Though introduced by the Portuguese, the Goans modified the celebrations in their own style without changing the dates.